What is it about sunsets on Maui? 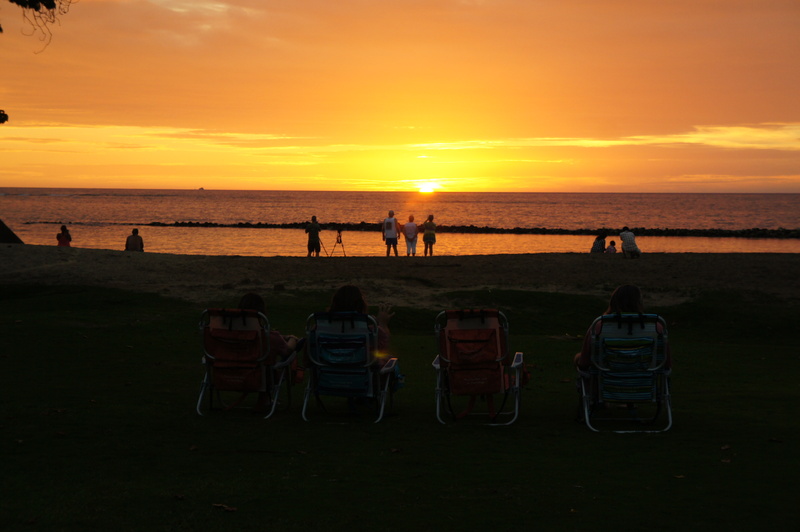 As my wife and I enjoyed another fabulous sunset last night, I was struck by the specialness of sunset time on Maui. As the time approaches, you’ll notice people of all types slowly starting to drift towards beaches or other outlooks to enjoy the simple but sacred ritual of saying goodbye to another day in paradise. Rich or poor, local or first time tourists, all can enjoy the same sunset free of charge. Some come well prepared…picnic baskets overflowing with gourmet goods and fine wine. Others come hungry, with just the clothes on their back. Many have cellphones ready to capture that perfect moment for posting on to Facebook. Some arrive hurried and frazzled, not wanting to miss a single moment (and then they are gone just as fast to the next thing on the schedule).The wise realize that sunsets are a gift to be received. Sure, take a picture if you like, but not at the expense of missing the show. Savor the moments before and after. This is a time to reconnect with something bigger than ourselves. We are reminded that the world does not revolve around us, and that time waits for no one. Each sunset is special and unique, and we can do nothing to control them. But we can control our response and appreciation for the amazing gift of colors and clouds and water and rain, and yes, God willing, another sunrise after the short night. This entry was posted in Uncategorized and tagged Hawaii, Maui, sunsets by davekresta. Bookmark the permalink.